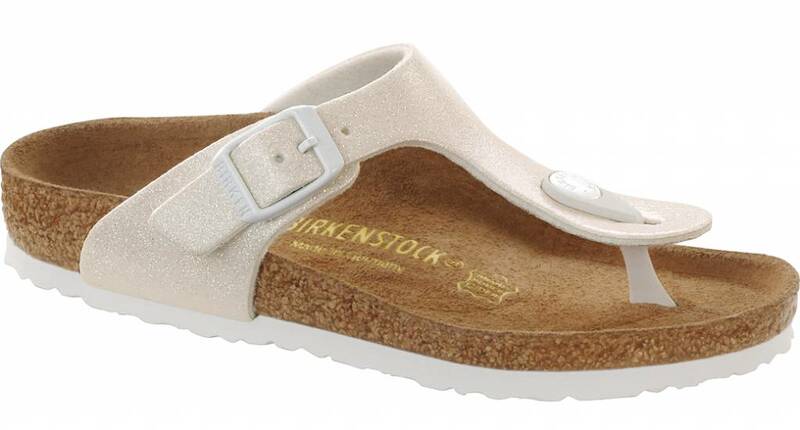 The creamy white Birkenstock Gizeh is a fine T-bar sandal with straps of Birko-Flor with sparkles. The cream coloured straps combine perfectly with the white EVA sole and white buckle. The T-bar sandal is easy to maintain because of the smooth surface. The lining of the straps is made of felt. The anatomically shaped cork foot bed has a deep heel indentation and toe grip. The sandal fits perfectly on the foot, so that it can also be used for long walks because it supplies optimal support. The Birkenstock Gizeh magic galaxy white is available in the width ‘normal’.